well it took stephan harding his student – and how ! so where to start for now ? 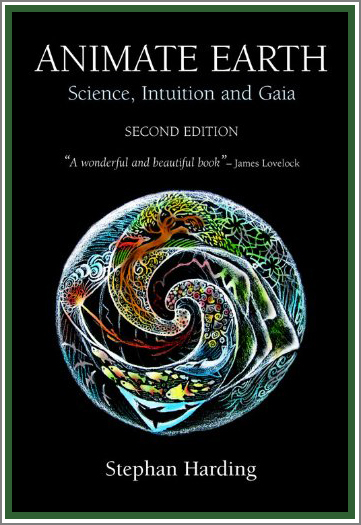 foreword of eminent gaia scholar, lynn margulis . . . I am reminded of the deep thinking of James Baldwin . . . himself disillusioned by the entrenched delusions and intolerant power structure . . . ‘ It’s hard to think of America as a culture . . . what it imagines itself to be is a collection of pragmatic, pious businessmen . . . nothing could be more sterile . . . sterile culture . . . contradiction in terms.’ It is ( that ) ‘stubborn, manic refusal to accept ‘ worldwide natural history that has promulgated the need, on a global scale, for the antidote of Harding’s Animate Earth . . . ( it ) should be translated into all the major languages of the world . . . Harding faces immense odds . . . in this realm of ‘ manic refusal ‘, this reductionist, mercantile world. I salute his valiant and mostly successful attempt to ‘ keep things whole ‘. At the end of this delightful narrative about the trials and tribulations on the Earth’s surface, you the reader will understand Gaia . . . ( she ) continues to smile: homo sapiens, she shrugs, soon will either change its wayward ways or, like other plagues species, will terminate with a whimper in the current scourge. have a look at stephan’s final chapter thoughts . . .
. . . we come to realise that Gaia is beyond our control – that it is impossible for us to ever be the masters or stewards of the Earth . . . also, it is hubris to think that we are the only sentient creatures inhabiting Gaia’s ancient crumpled surface . . . slowly we realise that we owe our very existence to the complex planetary intelligence that has run our world without our input for the last 3,500 million years . . . Whether you like it or not, you are utterly part of Gaia, biologically, psychologically and spiritually. Our very bodies, our dreams, our creativity, our imagination all come from her, and in the end the matter that we are made of will return to her when our lives are done. Once you allow yourself to feel this deep belonging to Gaia, there is no question that what we are doing to her now is wrong, and that we have to do something about it . . . Let Gaia take you over – let yourself be Gaia’ed over and over again.